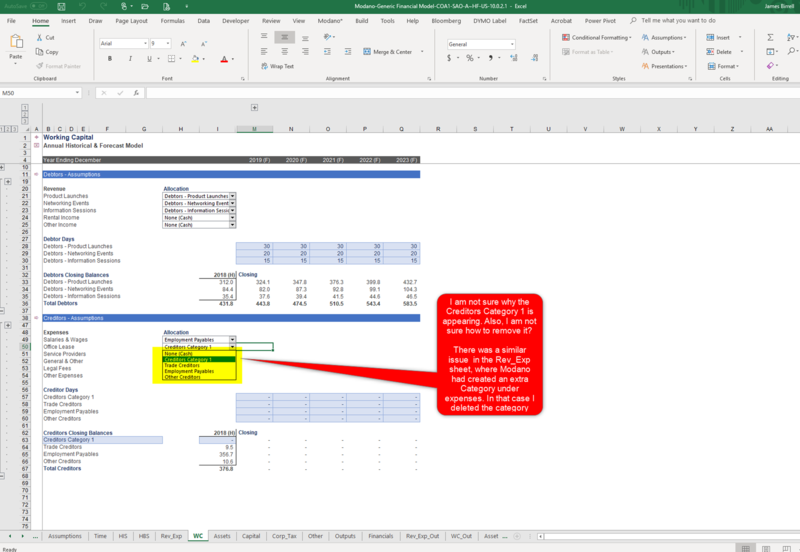 The spare categories you're seeing will have been created or overlooked during the Import Assumptions mapping process you undertook earlier in the exercise to import the historical income statement and balance sheet data. You needn't worry about them impacting the integrity of the model, and feel free to delete them by selecting a cell in their rows and using the Delete Categories command. I'd recommend always deleting them from the source so you're sure you're deleting redundant categories - i.e. in your above image delete row 63 to remove the unwanted creditors category. Funnily enough, I had this same issue last week after using the Import Assumptions tool and chopping and changing the mapping. It's nothing to be concerned about, as long as your reconciliation is correct. Just delete them and move on. Thanks Michael - I just hit the delete category for row 63 - seems to have done the trick!